Remember playing Scribblenauts? A game that became tremendously popular on Nintendo DS for being the first to include drawing in a puzzle and platform game. In the latter, we had to create paths and objects for our character to use in order to complete each level. Ever since then, this same concept has been used in many other more or less complex games such as this Love Balls or Brain Dots, a title with a similar target but with graphics that are more simple and plain. This game for Android introduces us to two tiny balls that have fallen in love and can't stand living apart. Your goal is quite clear: to draw a path with the appropriate shape so that inertia and gravity can do all the dirty work to reunite both balls. Draw a ramp, a curve or a bridge to bring these two spherical lovers together again. Each level has dozens of possible solutions and allows us to develop our imagination. 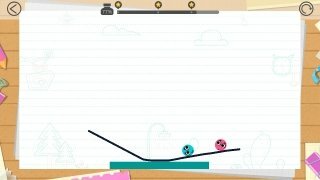 The scenario on each level recreates a cute notepad page and the obstacles that appear will get more and more complicated on each one of them. We can win coins on each level to unlock all sorts of pens, pencils, and fountain pens to carry on drawing. Perfect game for all age groups and to be played in family. Help these two lover balls to get together and never miss each other ever again.